I don’t know about your house, but the hours between 4 p.m and 6 p.m. are definitely not the happiest hours of the day in the Hines household. 5 p.m. is far from happy hour. Honestly, those hours have never really been that pleasant with small children, but, quite frankly, these hours have been extra annoying since school started. Once I wake BabyDiva from her nap to pick up her brother at school, the first of our troubles begins. One day, she rode to school without her shoes because she refused to put them on, and I didn’t have one minute on the clock to struggle with her to produce a different outcome. Several days in a row, she actually rode in the car without pants. Yes, she was pantless. She would fight me as I tried to put them back on. Oh, and did I mention that she can be cranky and clingy from being awakened from a deep sleep? I’m doing my best to stop the madness for my own sanity and put some happiness back in the afternoon. I’m starting to look for more crockpot recipes so I have less food to prepare for dinner and less stress. I found one meal that is a pure delight, and it made us all happy. It’s called “Peasant Stew,” but I think it is good enough for royalty. It’s delicious! I made some changes to the original cooking light recipe. Here’s my version of Peasant Stew. · Combine cumin, salt, and pepper; sprinkle over chicken. 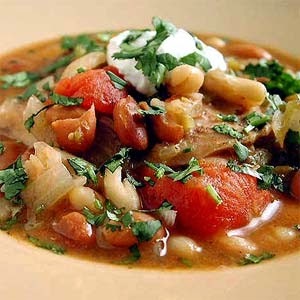 · Place chicken in an electric slow cooker; stir in onion, tomatoes, and chiles. Cover with lid; cook on high-heat setting for 3 hours. Stir in beans. Cover; cook on high-heat setting 1 hour. · Place 1 chicken thigh in each of 6 soup bowls; ladle 1 1/4 cups stew into each bowl. Top each serving with 2 teaspoons cilantro and 2 teaspoons sour cream. Hats Pants off to the Crockpot! 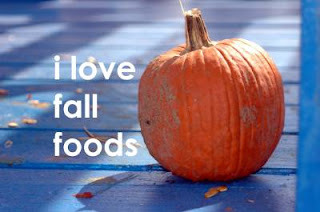 I'm linking this recipe to Kludgy Mom's I Love Fall Foods Post. Peasant Stew is a great fall meal that can be served on nights even when the carpool lane is closed. Happy fall!